This is a golf club dated to the 1760s based on New Zealand technology [or lab work] testing the metal. The note on the “precise” date of 1760s has a margin of error +/- 40 years, which means the club could range from 1720 t0 1800. So, this club is an example piece of the irons used in that time. The clubs in that day were generally set as wooden-headed clubs as well as one or two irons being cast-iron-headed clubs. 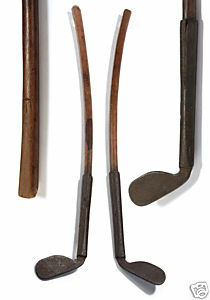 The use of these iron clubs was for the modern typical 5 iron to 9 iron, depending on the player’s prescribed make for the blacksmithy or cobbler or the like that fashioned the shafts and heads for the gentlemen players. Irons were not really the most common club, though the putter was often a iron-headed club. The predominance of wooden-headed clubs of course makes sense in thinking about the origination of the game of golf from shepherds’ crooks, wooden walking sticks. But it also follows the logic of the ease-difficulty of manufacturing abilities of the time: dealing with multiple media (iron and wood) would have been a much more difficult work. Also, who wants to carry around a heavy iron club, even if you’re only playing Leith Links, which was only 5 holes?